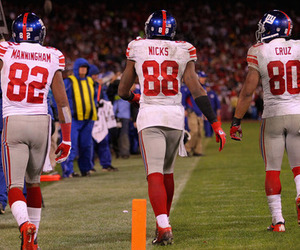 Of course Giants fans will be quick to point out the absence of Hakeem Nicks in that first game. In only his third year in the league Nicks has emerged as one of the NFL’s better playmakers. He’s gone over 1000 receiving yards for two consecutive seasons and racked up almost 800 yards during his rookie campaign of 2009 despite starting only six games. He emerged as Manning’s favorite target in 2010, though his status as favored son was short lived. Nicks’ absence in week eight allowed the Patriots to key on Manning’s new favorite weapon, UMass product Victor Cruz. After signing with the Giants as an undrafted free agent, Cruz tore apart the league. He finished with over 1500 receiving yards and 9 touchdowns en route to establishing himself as one the league’s most dangerous receivers after the catch. His 18.3 yards per reception were third in the NFL, and his record-tying 99 yard touchdown against the Jets kick-started the Giants hot streak that has them in the Super Bowl. Even with Nicks out and the Patriots rolling coverage in his direction Cruz finished with a team high 6 catches for 91 yards. Cruz’ emergence has come at the expense of Mario Manningham. Manningham was the Giants’ number two receiver in 2010, and with 944 yards and 9 touchdowns he looked to be a budding star. In the 2011 regular season he had only 523 yards and 4 touchdowns, partly due to injury troubles but also due to the amount of balls going to Cruz. Still, Manningham is a very good NFL player and his match up against Patriots nickel corners will be a key. Julian Edelman struggled late in the game against Baltimore when trying to guard Anquan Boldin. Edelman is a sure tackler, but his technique in coverage is understandably poor. Despite their depth issues, this defense can be said to be quite different than the one New York faced earlier this year. Both Patrick Chung and Brandon Spikes were lost to injury in the second half of the first meeting between these two. Moving Devin McCourty to safety in sub-packages has stabilized the Patriots’ nickel and dime defenses, but they still struggle to get off the field on third down. The Giants have been an excellent passing team on third down during the playoffs. If Belichick can coax a big game out of this secondary, it will be some of his best work yet.